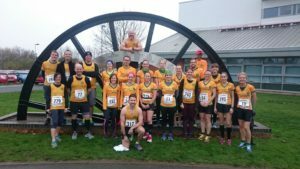 An impressive 33 Striders turned out for the Clowne Half Marathon. Triply impressive, given it clashed with Doncaster and Barnsley 10ks and the weather was not promising. As I left S6, the little orange “it’s cold” light was glowing from the dashboard, and the wipers were clearing away an unpleasant misty drizzle. Race HQ was in the municipal sports centre, a few minutes’ walk from the parking. Everything was very well organised, with plenty of time to get race numbers, drop baggage, bob to the toilet and then hover in the lobby, trying to decide how long I could reasonably delay going out into the chill. Finally, with just time for a team photo by one of the accusatory old pit wheels that litter the villages of Derbyshire, it was time to get to the start. I put myself in the 1:50 section, hoping for better. And off we went. The race is an anticlockwise almost-loop (it finishes at the Community Centre near the start) through mostly country lanes and villages, via some very inviting smells of cooking. The roads are partly closed and partly quiet, with a couple of police-controlled crossings. It’s well marshalled, with three water stops .The landscape today was mostly that distinctive grey-green-brown that tells you you’re in the East Midlands in winter. The first half of the race is an undulating descent, and I set off fairly well, keeping my pace below 5-minute kilometres and hoping to do better than the hungover 1:45 nearly-PB I’d surprised myself with at Worksop a few weeks ago. I warmed up, took my gloves off and rolled up my sleeves. This was nice. Then at about 5 miles, I ran out of fuel. I rammed down a bag of Haribo, accidentally swallowing some whole, and picked up the pace again, but never got back to the speed I’d been doing. My summary of the last 5 miles of this race is “it’s brutal if you’re tired”. None of it’s steep, but the majority of the 200m ascent is in this section, as was a massive Co-op artic trying to get past the runners. I spent most of this part passing and getting passed by a few of the large Dewsbury Road Runners contingent and thanking my lucky stars I’d brought gels. I even reached the point at about 20k of counting strides as a running metre-by-metre tally of what was left. I eventually rolled in about a minute slower than Worksop, and considerably more tired. And yes, like pretty much every race I enjoyed it and I reckon I can do better next year. I could barely walk after the finish. I managed to grab my (lovely and warm) race hoodie and a piece of flapjack, collected my bag, which had been handily moved to the finish, and trudged very slowly back to the car. I’ve raced (and run generally) far more this year than I ever have before and at longer distances. If you’d told me 18 months ago I’d be disappointed at two sub-1:50 half marathons in a month I’d have laughed at you. My knees, hips and muscles are really feeling it now though. It might be getting on for time for a winter break! Although I had a disappointing morning, at least seven of the Striders had a cracker: Fran Cummins, Michelle Vermeulen, Sarah Allcard, Chris Hodson, Andy Lock and James Boreman PB-ed and Mandy Taylor pulled off a brilliant category win. 741 runners finished the race, which was won by Richard Start of North Derbyshire in 1:14;09. First female was Rosie Haddock (unattached) in 1:27:05.